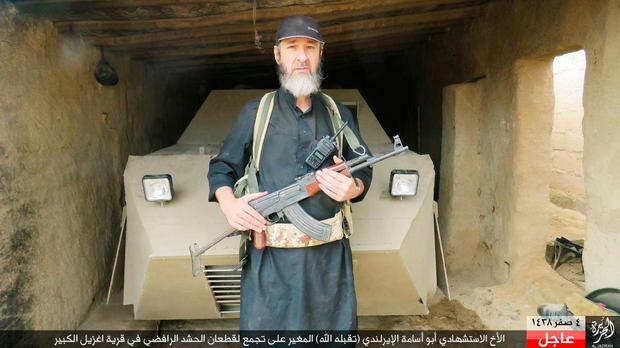 An Irish jihadist has died in a suicide bomb attack in Mosul, according to claims by the Islamic State. Abu Usama Al-Irlandi, better known as Khalid Kelly, was reportedly killed during fighting for Iraq's second largest city. ISIS twitter accounts and reports from Iraq suggest that he died in the name of the Islamic State. Al-Jazirah, an ISIS outlet, and several known ISIS twitter accounts posted a picture of a bearded Kelly posing in front of the VBIED (vehicle-borne improvised explosive device) clutching a Kalashnikov rifle. Kelly, aged in his 40s, allegedly used the VBIED to attack Iraqi state forces as they moved through the ISIS-held desert territory in the Niniveh Governorate. Another picture posted purported to show the moment Kelly’s vehicle exploded in the village west of Mosul. The reports of Khalid Kelly's death have not officially been confirmed. Born and raised in Dublin Terence Edward Kelly (49) converted to Islam after he was jailed for making bootleg alcohol in Saudi Arabia in 2000. He had trained and worked as an intensive care nurse. Reports have suggested he has a daughter and two sons living in Ireland. Upon his return to Europe he became an outspoken supporter of Al Qaeda and even appeared on the Late Late show alongside controversial British cleric Anjem Choudary. He was arrested by Gardai ahead of the visit of US president Barack Obama in 2011. A spokesperson for the Department of Foreign Affairs told independent.ie that the office is "aware of media reports concerning an Irish citizen in Iraq and is seeking to clarify the situation". Martin Evans Facebook has helped introduce thousands of Isil extremists to one another, via its 'suggested friends' feature, it can be revealed. Shona Murray US President Donald Trump says he is "starting the process of terminating" the diversity lottery programme in response to Tuesday's terror attack in Lower Manhattan. John Davison and Rodi Said U.S.-backed militias said they had defeated Islamic State in its former capital Raqqa on Tuesday, raising their flags over the jihadist group's last footholds in the city after a four-month battle.